Top 5 on the list. Korea sat in the top 5 on my list of places to visit, so when a client called asking me to hop on a plane to visit and discuss a project, it took everything I had not to shout "HELL TO THE YES" at the top of my lungs! It was a quick trip...landed on a Tuesday (Korea time), flew out the next Saturday. But a whirlwind it was! Now, a couple disclaimers to this post: this was primarily a business trip, before this blog was created, and all photos were taken with my iPhone 6s' (work and personal) . Outside of pencil skirts and PowerPoint presentations, I really only had 36 hours to explore on my own. Even so, our Korean hosts were so gracious and eager to share their culture with us, even on the work days, we visited traditional Korean sites, they treated us to excellent meals (just wait for those pictures! ), and gave us great suggestions for our free time. PRO TIP: I know they say that you shouldn't deprive yourself of sleep the night before a long haul flight...I disagree. If you're one of those people like me who does not sleep well on planes, tire yourself out to the point that sleeping uncomfortably will be easy for you...or order a lot of drinks! Either one works just fine. I departed SFO at 10:50am on Monday, July 10 on the granddad of all transpacific airliners...the Boeing 474. I walked in, passed all of the rows of full-recline seats complete with personal TV screens and made my way back to the Economy Plus cabin. Unfortunately, I sat in one of the middle seats in the middle section next to a Korean lady that didn't speak a word of English. She nearly caused an international incident when she (not once, but THREE TIMES) turned off my air vent because she was cold...no ma'am! I touched down at Incheon airport around 2:45pm Tuesday, July 11th after the sleepless 12.5 hour flight. After deplaning, it's the typical customs and immigration regiment and the Incheon airport has it down. Lines are nice and simple, lots of agents' windows are open and they get you in and out without problem. After retrieving my luggage, I headed out to find my Korean host. She greeted me happily and we sat down to wait for my other coworker to arrive. 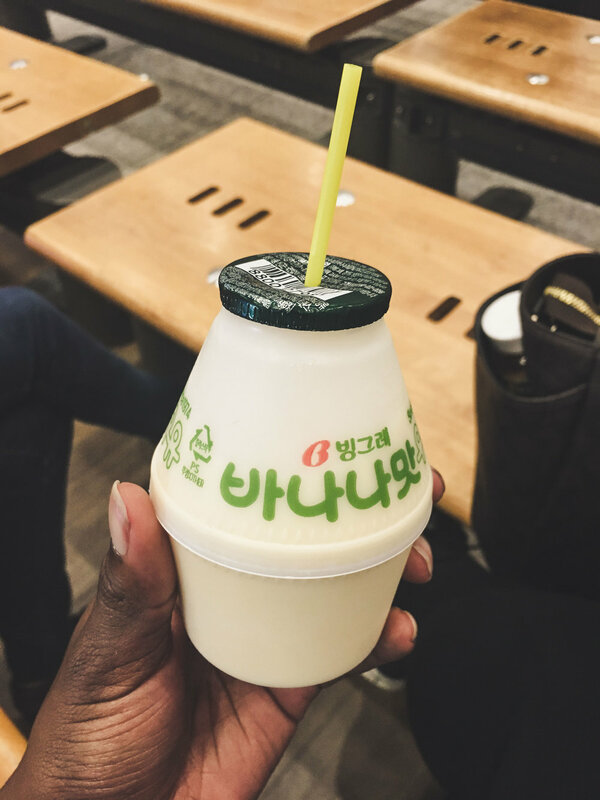 While waiting, she walked to the copious vendors in the airport concourse and brought my back this traditional Korean banana milk. I'm sadly lactose intolerant, but the couple sips I took were DELICIOUS! My 7 year old self was in banana heaven! The rest of the afternoon was spent in the back of a Hyundai Sonata, carting us from the island of Incheon where the airport sits to the inner depths of Seoul. As with any country foreign from your own, driving styles are very different. I forget the conservative nature of US and most Eastern European countries. I admired the interesting cars (I have a thing for cars. That will probably become evident) and intriguing architecture. But something about Seoul felt very familiar. In many ways, Seoul is an expansive Manhattan. Densely populated with 30+ story apartment complexes towering above. Restaurants, coffee shops, retail stores and businesses occupied every nook and cranny, every alleyway. The movement of the city is electric. This tiny little nation that is 7 times smaller than the state of Texas has the 5 largest GDP in the world. And it shows. Constant construction to usher the city into the modern era is prominent. Bentleys, Mercedes, high-end Kias and performance geared BMWs lined the busy streets. Women and men carrying shopping bags and the niche retail 'boroughs' always packed shoulder to shoulder. That evening, we attended a very traditional, 16-course Korean dinner, of which I took no pictures, as an iPhone or camera would have felt very out of place in that setting. We stayed in the Shilla Stay Gwanghwamun Hotel, a nice tourist hotel recommended by our hosts. Excellent breakfast buffet with a multitude of options for those around the world. PRO TIP: Bring blotting paper and powder to keep yourself looking fresh. Also pack and extra pair of undies if you tend to sweat a lot (like yours truly). No one likes a swamp crotch. Freshwater Eel grilled in the middle of the table. Incredibly fresh, and oh so delicious. The next morning was getting down to business (peep the fresh-faced, business-ready selfie). Despite the meetings and business, but the most stifling part of the trip was the humidity. Now...I went to school in Louisiana where a bayou ran right through campus, but these percentages were out of control (85-93% all the time!!). Makeup melted within hours, just walking from the car to the building. That night we stayed in the Lee Design Hotel...a BEAUTIFUL, modern hotel with saunas and balconies in nearly every room. They had a great outdoor patio for breakfast. I learned very quickly that air conditioning was not a priority in Korea as it is in the US. A/C is mounted to the wall, but blows warm, takes quite a while to cool down and does not blow very hard. They do not air condition hotel hallways or the interior of many shops and store...even if it's 89 and 92% humidity. PRO TIP: In a market, find a street retail vendor that is sells manual folding fans. They are dirt cheap but a life saver when there is little wind and high humidity in the summer months. After work that day, our hosts took us to the National Folk Village of Korea. Certainly a site to see and worth the drive from Seoul if you have the free time! It's a re-creation/preservation of an entire village and the way life in Korea looked in the not so distant past. Mud houses, wooden huts, and an entire city that you can touch, walk around in and experience first hand. It's a working farm and horse ranch to add to the authenticity. There is a gift shop and a restaurant that serves traditional Korean fare as well. We had one more work day ahead of us with our Korean hosts, then we were able to explore on our own. In the part II of this travel diary, we will explore Seoul, and you can see how I tackled this massive city in less than 48 hours! More on the way!